Sometimes the simpler the cleaning product, the better. Enter the microfiber cleaning cloth. Microfiber is made from fibers of polyester and nylon that are cut down many times; thinner than a piece of human hair. Microfiber is not naturally occurring and is synthetic. Microfiber promotes an electrostatic charge. Magnetizing dust and grime easier than a natural occurring material. Microfiber vs Cotton – Cross sections: microfiber thread above, cotton thread below. Microfiber leaves no residue, contrary to cotton. The reason microfiber is able to pick up dust and grime easier is because of the fiber it is made of. The fine, intricate, and wedge shaped fiber of a microfiber cloth has the same shape of a star up close. Compared to a cotton product which has a circular, more smooth construction. The wedge shaped fiber allows for dust to be trapped easier then with the cotton material. Use Microfiber wipes for cleaning almost any surface. Use on windows, floors, and for dusting. These cloths are the definition of environmentally friendly. You no longer need to use any harmful cleaning products and can get the job done only using water. This reduces the risk of chemical spills or harm to employees in the workplace. Even though you are ditching the harmful chemicals you are still getting streak-free cleaning. One of the most common properties of microfiber fabric is its ability to wick moisture. This means that it is both absorbent and dries quick. Microfiber is more sturdy then cotton. The material dries quicker, which allows less time for bacteria to emerge. Automotive Prep/Care: Absorb more water and faster than cotton. Microfiber cloth will be able to dry cars faster with less wastage. Microfiber cloths also result is a spot free shine with no residue left on the car with less risk of scratches. Industrial/Commercial Dusting: Small wedge-like fibers create almost magnetic attraction to dust. This is great for places that need a clean wipe down fast like hospitals. Shine Chrome: Chrome fixtures and products tend to lose their shine over time. Use this to shine office appliances or wipe down products before you ship them out to your customers. The microfiber cloth will enhance the chrome shine, leaving a dazzling finish. All industries can benefit using colors to clean. Including: medical centers, hotels, restaurants, schools, daycares, and nursing homes. Use Microfiber cleaning cloths in different colors so that a color-coding system can be implemented for specific uses. For instance, in bathrooms, red cloths can for toilets and yellow cloths for sinks. Blue cloths can be for office cleaning. Yellow: Cleaning objects and surfaces in rooms and lower risk areas of restrooms, including sinks. Blue: Use in lower risk areas such as common areas. And for general purpose cleaning of surfaces such as glass and mirrors. 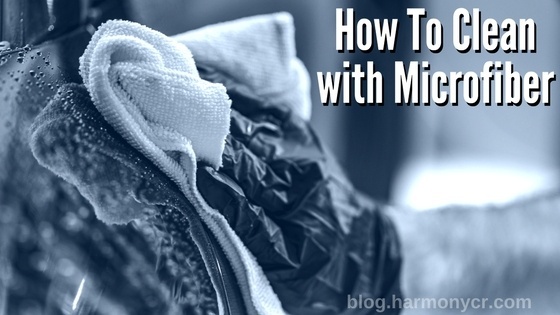 Protect your hands using disposable nitrile gloves when cleaning with microfiber. And to ensure an hand-oil and smudge-free finish. Having these cloths also don’t have a great deal of upkeep and can last a long time if they are kept up. Breakdown the cleaning process down into light cleaning and heavy cleaning. Light Cleaning: If you are using these cloths for light cleaning, wash by hand without soap and leave to air dry. Heavy Cleaning: For heavier cleaning use a washer and dryer. It is still best to not use detergent and to wash and dry on a low temperature to make sure these cloths last longer. To find a selection of microfiber wipes you can visit our store.